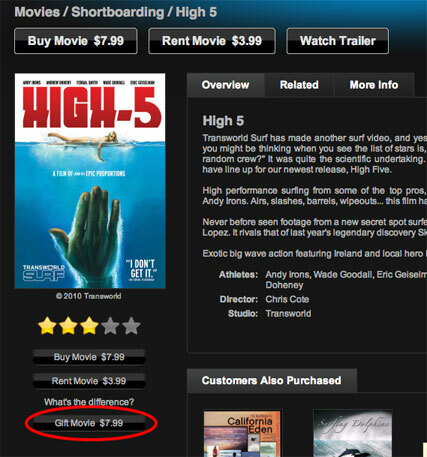 Learn how to purchase and redeem TheSurfNetwork.com gift certificates by following the instructions below. 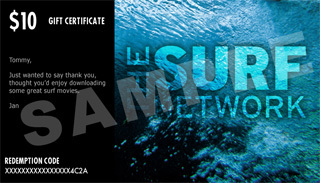 You can purchase a TheSurfNetwork.com Gift Certificate in email or paper form. You can have the TheSurfNetwork.com email the certificate to your recipient, or you can print out the certificate on your own printer for personal delivery. You will need a credit card to make the purchase. If you haven't already signed in to your account, you will be asked to sign in. In the resulting screen, enter details such as your recipient's name, your name, a personal message, and the amount you wish to give (choose a dollar amount--from $10 USD to $100 USD--from the Amount pop-up menu). Depending on which delivery method you have chosen, you may also need to enter your recipient's email address. In the resulting screen, verify all the information is correct. If everything looks good, click the Complete Purchase button to make the purchase. In the subsequent screen, enter your gift certificate number (redemption code) printed on the front of the gift certificate or found in the emailed certificate into the field. Click Redeem. If you haven't already signed in to your account, you will be asked to sign in. Once you redeem your certificate, the full amount appears next to your account ID in the upper-right part of the website as credit. Any time you buy an item, the purchase price will be deducted from the balance. If the certificate was product specific, the item purchased as a gift will be automatically added to your My Video Library and be immediately available for download. Find a movie, episode or complete season that you want to give as the gift. In the resulting screen, select the delivery method, either email or print and then click continue. You will then need to fin your recipient's (and your) details, such as names, email addresses, and a personal message. Once you have successfully signed in and completed the gift form, you'll be brought to a page to review your purchase and confirm it. If everything looks good, click the Complete Purchase button to make the purchase.